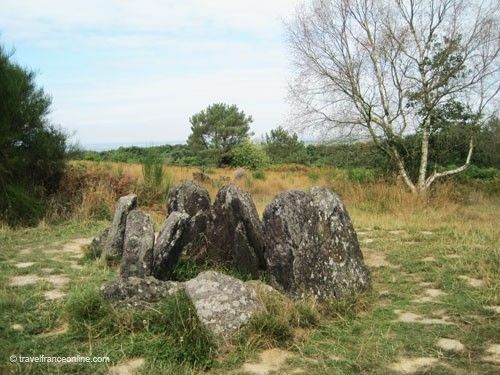 The Hostie de Viviane is a group of megaliths arranged in ellipse and located in the moors of the Forêt de Brocéliande. Locals often refer to it as the Maison de Viviane, as in local Gallo language hostié means house. According to an ancient legend, the stones were those of the castle where the fairy came to rest and meditate. However, the Hostie de Viviane is also known as Tombeau des Druides and is an ancient burial chamber. It was built around 4500BC on a small hill peaking at 191m above sea level. It consist of a single chamber surrounded by a group of small stones positioned in a 19m diameter ellipse. Excavations uncovered polished axes, pottery fragments, flint, arrowheads and jewellery. Archaeologists discovered another megalith, a dolmen, a little bit farther down the hill from the Hostie. They therefore believe that the hill was a sacred ground dedicated to the Dead. 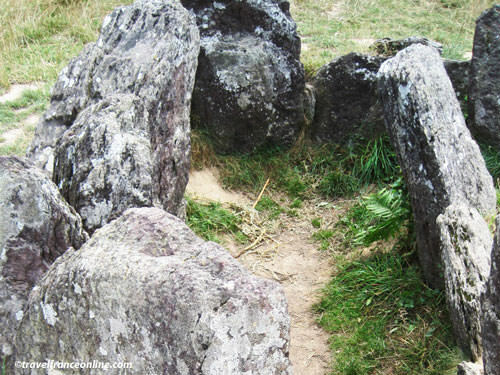 Celtic druids most likely re-used these sacred sites in order to conduct their own religious rituals. However, no druid grave was ever recovered from any of the sites. There are two ways of getting to the Hostie de Viviane. However, even the paths that lead to it has their own legend! If you enjoy hiking, you can follow the paths of the Valley of no Return, the Domain of Morgan le Fay. But, beware of not walking on the Herbe de l'Oubli, the Grass of Oblivion that removes any memory and makes you lose your way! The others can drive to the hamlet of La Touche Guérin, where they'll find a small parking lot and the path to the Hostie (10mn walk). This farm track leads to the top of a rocky ridge, which according to legend, is the back of a sleeping dragon. The dragon has been asleep since time immemorial and is oblivious to human noise. However, he'll wake up if you set foot on a particular spot of his back. No one seems to know where this spot is located, so beware of the dragon on your way to the Hostie de Viviane! Land of the Dead or Fairy's castle nestled in the moors, the Hostié belongs to the realm of the imagination. However, no one can be indifferent to the wild and enchanting beauty of the spot. Directions: Follow the D40 from Paimpont to Trecesson - You'll find a small car park to the right and at the exit of La Touche Guérin hamlet. Follow the farm track originating by the car park , keep to the right for about 200m. Walking shoes compulsory.